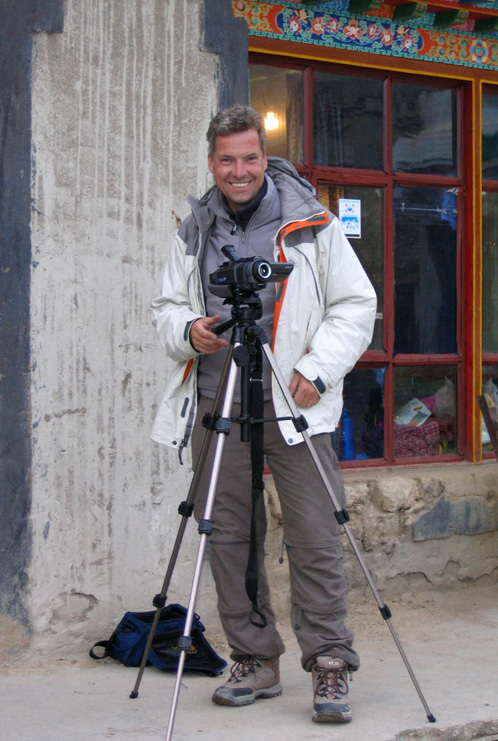 Filming at Everest base camp, August 2005. Nick Cope is a British filmmaker and academic, who has been making and screening film, video and digital media work since the early 1980s. Currently based in Suzhou, near Shanghai, China, lecturing in digital media production at Xi’an Jiaotong-Liverpool University, where he is Associate Professor in Communication Studies. Prior to taking up this position in February 2014, Nick worked as Senior Lecturer in Video and New Media Production at the University of Sunderland in the north east of England for almost ten years. Nick completed a PhD in October 2012, which locates his contemporary visual music practice within current and emerging critical and theoretical contexts and tracks back the history of this practice to initial screenings of work as part of the 1980’s British Scratch video art movement. Nick has worked in higher education since 1995, teaching 16mm film and video production as a Technician Instructor at Southampton Solent University, before taking up his first lecturing post with the University of Hull, as Director of Studies for Digital Arts, in 2001. Before this Nick spent 8 years based in London working in the media and creative industries, after graduating from Sheffield City Polytechnic’s Psalter Lane Art College in 1986. Nick continues to screen work nationally and internationally in cinema, gallery, installation and live performance contexts, and is always happy to discuss opportunities for further screening and presentation of work.